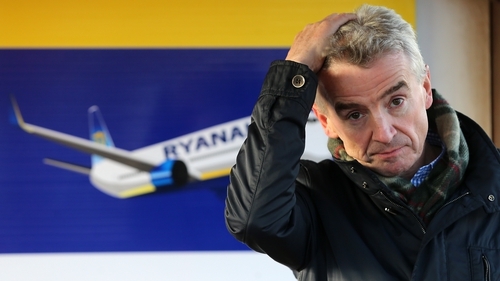 Ryanair and its CEO Michael O'Leary are being sued in New York by a shareholder accusing the airline of defrauding its investors, and inflating its share price by overstating its ability to manage its labour relations and keep costs down. Ryanair described the claims in the lawsuit as "false" and "doomed to fail" - and has pledged to defend itself fully against what it called "bogus ambulance-chaser" claims. According to Reuters, it is not uncommon for shareholders to sue companies in the US after what they consider are unexpected share price declines. The lawsuit entitled ‘City of Birmingham Firemen's and Policemen's Supplemental Pension System v Ryanair Holdings Plc’ has been filed by an Alabama pension fund seeking class action status and damages for investors in Ryanair's American depository shares from 30 May 2017 to 28 September, 2018. In September 2017, it emerged that Ryanair had miscalculated annual leave for its pilots, resulting in staff shortages. That in turn triggered the cancellation of thousands of flights and disruption for hundreds of thousands of passengers. In December 2017, Ryanair recognised unions and suffered a number of strikes over the summer. On 1 October this year, the airline cut its full-year profit forecast, citing a number of factors including labour issues. At that point, its share price closed more than a third below the level in mid-March. The US law suit accuses Ryanair of misleading investors in regulatory filings and conference calls about its labour stability. It states: "Unbeknownst to investors, the company's historical profit growth was built on an undisclosed and unsustainable foundation of worker exploitation and employee turnover." It goes on to claim: "The decline in the price of Ryanair ADSs was the direct result of the nature and extent of defendants' fraud finally being revealed to investors and the market." Ryanair said it had not yet received any such documentation, but said the claims were doomed to fail as they have no basis in fact or reality. In a statement, the company said Ryanair is one of the best performing airline shares in 2018, despite significantly higher oil prices and lower fares which are affecting all EU airlines. "Contrary to these invented claims, Ryanair has experienced very little industrial action this year from its staff," it stated. "Over just eight days (five days of action by just 25% of Irish pilots, and three days of action by less than 25% of cabin crew and pilots across five other EU countries) Ryanair continued to operate more than 90% of its published schedule with minimal customer disruptions." Ryanair said that as with other EU airlines, most of this year's flight disruptions were caused by air traffic control strikes and shortages, mainly in France Germany and the UK.